Through our knowledge and experience within the aggregate processing industry and our extensive investment in equipment and management /operative training, Response Engineering Solutions can offer and complete specialised confined space access and maintenance operations. 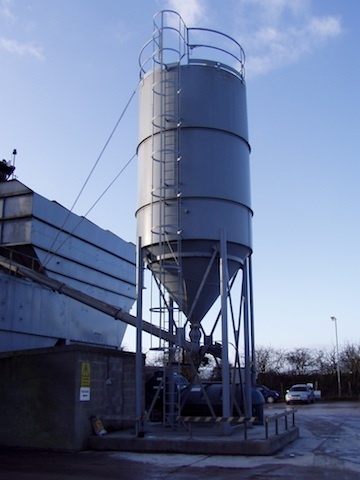 Material Storage Silos, Hoppers & Bins, Crushers, Pan Mixers, Paddle Mixers, Ducting, Transfer Chutes, Screening Assemblies, Baghouse Filters, Water/Fuel Storage Tanks, Weigh hoppers, Skip Units, Elevators, Dryers, Lagoon Platforms. • Assess required work and develop methodology for the safe means of access. • Provide suitably trained and competent operatives to complete required work. • Provide suitable, test certified confined space access and rescue equipment. • Compile detailed risk assessments and method statements. • Compile rescue plan and emergency procedures. • Assess full COSHH requirements and implement appropriate actions. For further information regarding confined space working and legislation please click this link to the Health and Safety Executive website.